Have you seen or heard about the new Weight Watchers Freestyle program? It works a lot like their Smart Points program, but it includes a new list of about 200 foods that are ZERO points! Most notably are eggs, beans, corn and chicken. This sounds really terrific, right? Point free food is always a big plus in my book! I’ve had slow but decent weight loss with the Smart Point program. I thought the Freestyle program with all that “free” (as in zero points) would be the absolute bomb, but it didn't take me long to realize that I wasn't losing weight. How could that be? I was following all the rules, so where was I going wrong? Then, one day, while browsing through some terrific recipes I saw a zero-point cheesecake and thought "How can this be zero points?" While it IS zero points, it certainly isn’t zero calories. Infact, it was over 700 calories for the entire cheesecake! 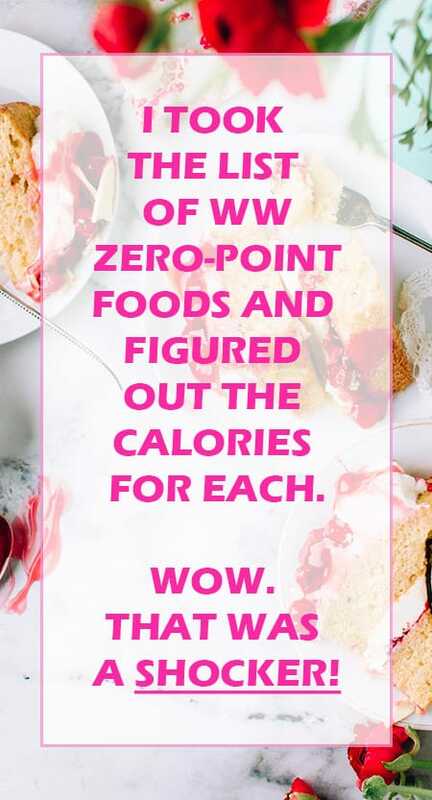 Let me tell you my little brainstorm in one sentence: ZERO POINTS DOES NOT EQUAL ZERO CALORIES! I took that list of zero-point foods and figured out the calories for each one. WOW. That was a shocker. I was eating WAY more calories than I should have been. I explain more about that in this in this article (The #1 Reason You're Not Losing Weight On Weight Watchers Freestyle). I’m sharing my list of the zero-point foods and their calorie count, so you can figure out where you are going wrong with your freestyle program. Zero-point foods are a great tool, but they are NOT calorie free. Check out my list below and use those foods wisely and in moderation! * All fruits and vegetables should be fresh, frozen, canned (drained) without added oils or sugar. They can be raw or cooked but cannot be juiced. All seafood and poultry are to be consumed fresh, frozen or canned using 0 Smart Points sauces or spices but cannot have added oil. They can be raw (in the case of sushi) or cooked.